Brazilian White Clay is formed after floods of the rainy season starting late November to February and the high-water season – from March to May the Amazon rivers rise and flood the low-lying forests. From June to August, floodwater begins to drain leaving behind throughout the banks of the Amazon Rivers, beaches, and islands a nutrient-rich soil. In the Amazon, the soil’s particle size decreases significantly with increase in soil depth. Amazonian White Clay is found in the soil’s layer within inches of the topsoil. Iron is an essential nutrient for the skin beauty. Iron carries oxygen to all the cells of the body, ensuring the “breathing” of each. When there is a lack of the mineral, besides the cell does not breathe, it does not have the energy to get rid of toxins acquired in the day-to-day, which will accumulate until a time crashing completely. When this happens, the disease is installed. Boron helps absorb vitamin D, which protects the skin against infections, reducing psoriasis lesions, help repair skin damage, prevent infections within skin injuries and rejuvenate the skin. Potassium is an element that is present in higher concentration in muscle and nerve cells. It is responsible for keeping our body hydrated, maintain muscle contraction and heart function and in the transmission of nerve impulses, and regulation of pressure between the inside and outside of cells – fundamental to expel toxins accumulated in the cell membranes avoiding premature cell death. Calcium – acts as a regulator in many cellular processes such as differentiation and cell division (that means it is essential for skin renewal), restores natural skin lipid membrane (prevents dryness and dehydration, and recover the skin after treatments like peels, lasers, or after exposure to cold or sun). Regulates the normalization of skin color (helps in whitening spots) and also assists in the production of natural antioxidants of the skin (which slow the environmental and chronological aging). Sulfur has been known as the “beauty mineral” because it helps the complexion and skin stay clear and youthful – Present in two B vitamins, thiamine, and biotin – thiamine is fundamental for healthy skin and biotin to hair. Plays an essential role in enzyme reactions and the synthesis of collagen and also present in keratin – necessary for the maintenance of the skin, hair, and nails, helping to give strength, shape, and hardness to these protein tissues. Being an antiseptic and germicidal and, also helpful for controlling inflammation caused by microorganism’s growth on wounds and acne. 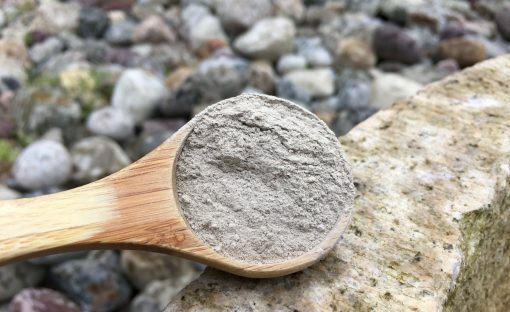 Brazilian White Clay is an excellent ingredient for facial and hair masks, creams, lotions, soaps, cleansers and body scrubs. It has skin’s lifting and revitalizing properties, helps to reduce wrinkles – use in face masks. An excellent ingredient to be used in body wraps intended to reduce swelling caused by lack of blood oxygenation and flow, improving the lymphatic system, reducing fat dimples & cellulite.